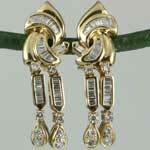 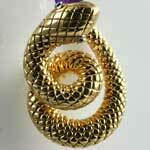 Vintage diamond eyed coiled yellow gold snake pendant in 14kt yellow gold. 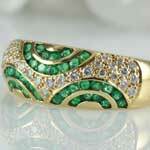 Natural dark green emeralds curve amongst bright white diamonds in this captivating estate emerald diamond 18kt 750 yellow gold band ring. 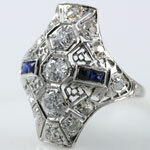 An Art Deco Old European-Cut Diamond and blue sapphire filigree dinner ring (1.30 ct tw, SI1-2, G-H). 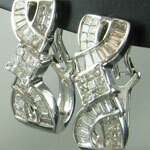 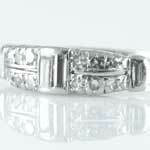 Stunning ladies narrow 1930s Art Deco diamond wedding band in platinum ( 0.34 ct tw). 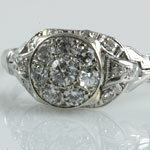 1930s Art Deco Old European diamond flower basket gold cluster engagement ring (0.65 ct tw). 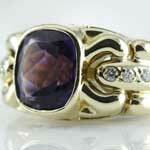 Vibrant deep purple amethyst diamond ring in 18kt yellow gold signed by Denoir. 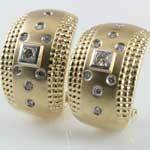 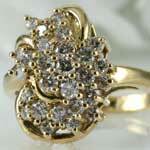 A bright, shiny almost 1 carat diamond cluster ring in 18kt yellow gold. 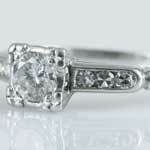 This lovely 1930s estate diamond engagement ring in platinum (0.48 ct tw). 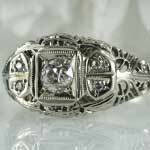 Estate ladies diamond white gold filigree engagement ring from the early 1900s.